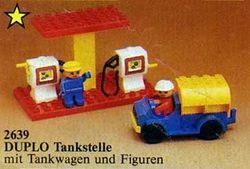 2639 Petrol Station is a DUPLO Town set that was released in 1984. It contains 14 pieces consisting of a red, yellow, white, and black gas station with two pumps, a truck, and two DUPLO Figures. Facts about "2639 Petrol Station"
This page was last edited on 9 January 2016, at 05:51.